Ralf Jungmann recently won an ERC Starting Grant – and with it a physics professorship. His research utilizes DNA-based nanotechnology to visualize biological structures that have dimensions of a few nanometers. Conversations with physicist Ralf Jungmann demand a great deal of concentration. He takes one at a sizzling pace through a world that is inconceivably minute, a world which, according to the laws of optics, is not directly accessible to even the best light microscopes. It is also the microcosmos in which biological processes are at home. Its denizens are the metabolites and macromolecules whose interactions determine the course and the limits of our lives – and we still know very little about it. But Ralf Jungmann’s ambition is to bring every molecular machine in the cell within the purview of light microscopy, a task that inevitably leads him to the frontiers of the physically feasible. Together with his 11-member team, Jungmann, who has just been appointed to a professorship at LMU, is developing a so-called super-resolution microscope for biomedical applications, which is designed to image cellular structures with the aid of DNA-based labeling techniques. The project has received funding from highly selective grant programs run by the Deutsche Forschungsgemeinschaft (DFG) and the European Research Council (ERC). The field of super-resolution microscopy has become quite crowded in recent years, and a great deal has been achieved that seemed impossible not so long ago. Jungmann (35) reels off the acronyms of the new techniques that have emerged, from STED, STORM and PALM microscopy to the fascinating Lattice Light Sheet microscope, which scans cells systematically level by level. As the listener wonders how these various approaches differ, Jungmann remarks with a laugh: “In principle, they are all very similar to one another.” In moments like this, one realizes that this off-handed familiarity is the product of hard work and hard thinking – given that one is dealing with methods that lie on the very edge of current technology. Less than 2 years ago, in 2014, physicist Stefan Hell in Göttingen shared the Nobel Prize in Chemistry with the Americans Eric Betzig and William E. Moerner. 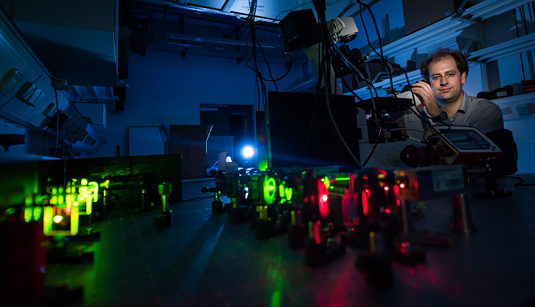 All three had found ways to bypass the classical diffraction limit and enhance the level of resolution of optical microscopy by up to 10-fold. Since then, they have extended the limit still further, into the nanometer region. “My goal is to boost the resolution of fluorescence microscopy by combining it with tools from the world of DNA nanotechnology, such as DNA origami, to prepare highly specific fluorescent probes,” Jungmann explains. By this means, one can attain a level of resolution which permits one to visualize structures at the molecular level. ‘DNA origami’ is another term that keeps turning up in the nanosciences. By analogy to the Japanese word it borrows, it refers to the art of creating patterns and three-dimensional structures – not from a sheet of paper but a set of DNA strands. Those are lofty goals, but Jungmann has made considerable progress towards realizing them. As a student and post-doc, he received several awards and fellowships, from the German Academic Exchange Service and the Humboldt Foundation. He developed an interest in the nanoworld while writing his Diploma thesis (on the effects of strain on the fine structure of human bone) at the University of California in Santa Barbara, when he came across a paper by the American researcher Paul Rothemund. The study described how DNA strands with defined sequences could be used to self-assemble into nanometer-sized patterns and figures, including the iconic smiley. “I found it absolutely fascinating.” Jungmann returned to Germany and joined the DNA Nanotechnology Laboratory led by Friedrich Simmel, Professor of Bioelectronics at the Technical University of Munich (TUM). “We pioneered the technique of DNA origami in Germany,” he says. Jungmann soon realized that tools from the world of origami could be utilized for microscopy. With his newly acquired expertise, he returned to the US to join Harvard.